I attended this webinar this morning about MobilEdu. It's essentially housing all the web components of a school as apps on a mobile device. 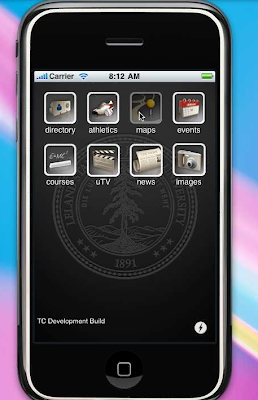 For example, things such as a school director, athletics, maps, events, courses (registration-add/drop), News, and Library can all be accessed through a free app that is downloadable to your mobile device that has web service. Schools such as Stanford, Duke, Texas A&M, UC San Diego, University of Washington all utilize this service as they see an increase of students using mobile devices. Maps of buildings on campus are readily available for students to find their way to their classes. An expanded photo of the building is also available if you click on your desired destination. Bus routes are also available according to your destination. Routes are supplied in addition to a schedule of time. Students also have access to web services such as registration. They can search, add, or drop courses. Final grades from previous classes are also available to them as well. I asked the question of current grades, but this is not available yet. A media library is also available from the school's archive. Photos and videos are readily accessible through this app. The search for books will result in the bibliography in addition to whether it is checked out and what library it can be located.